Team Jets can still win Premier League Two, according to centre and former Scotland international Jacy Brown. The Jersey side registered their third successive win, and extended their unbeaten run to five matches, by beating Kent County 62-50. The Jets are fifth in their league, 20 points behind leaders Tameside, who have won all 11 games this season. "We want to get first and go straight up without the whole pressure of play-offs," Brown told BBC Radio Jersey. "Who's to say we can't get that first place and keep going the way we're going." 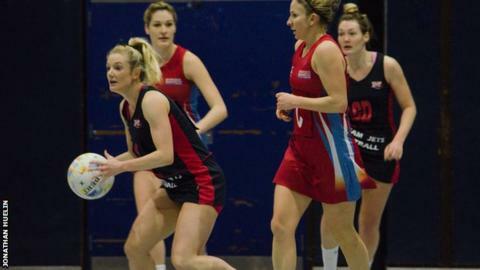 Jersey lost five of their first six matches after winning promotion to the second tier of English club netball last year, but have now found their feet. "We know if we've got our starting seven out there we can perform at this level," said head coach Linda Andrews. Only the team finishing first in League Two will go up automatically. The second to fourth-placed sides will take part in play-offs with the next-to-bottom side from League One for two places in the top flight.